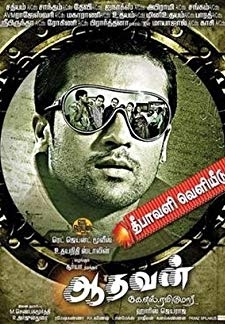 © 2018 Scratchu.com Aadhavan | Suriya, Nayanthara, Vadivelu, Saroja Devi B., Murali, Sayaji Shinde, Anand Babu, Rahul Dev, Ramesh Khanna, Sathyan, Manobala, John Leon Bennett, K.S. Ravikumar, Udhayanidhi Stalin, Félix-Antoine Bergeron - Aadhavan (2009) | Tamil Movie | 5.2/10 | Synopsis : Aadhavan, a sharpshooter, is hired by Dr Reddy to kill magistrate Subramaniam, who is set to uncover a list of culprits involved in an organ racket.... Watch Online!! !